See Important Notes and Disclosure below. Past performance does not guarantee future results. Investing in publicly held securities is speculative and involves risk, including the possible loss of principal. Historical returns should not be used as the primary basis for investment decisions. The performance described represents our closed pooled investment funds organized since 1/1/2000 only and does not represent the performance of all advisory clients. Although the statements of fact and data in this report have been obtained from sources believed to be reliable, 2nd Market Capital Advisory Corporation (2MCAC) does not guarantee their accuracy and assumes no liability or responsibility for any omissions/errors. Calculation Methodology: Returns were calculated by 2MC with data from our qualified custodians using the Modified Dietz method, a time-weighted measure of performance in which cash flows are weighted based on their timing. Dividends were paid, but not reinvested. An annualized total return is the geometric average amount of money earned by an investment each year over a given time period. It is calculated as a geometric average to show what an investor would earn over a period of time if the annual return was compounded. An annualized total return provides only a snapshot of an investment’s performance and does not give investors any indication of its volatility. Use of Leverage or Margin Corsaires Funds, by prospectus, had individually varying capacities to borrow capital to leverage investment (typically described as margin) thereby increasing both the possibility of gain and risk of loss. Margin limits were capped at 1:1 or 100% borrowings against net equity. Benchmark Information: Corsaires Funds are compared to the MSCI US REIT Total Return Index (RMS) because the issues we research, target, and invest in, are members (or aspire to be members) of the RMS or compete in the broad REIT sector. The MSCI US REIT Total Return Index (RMS) is a free float-adjusted market capitalization index that is comprised of equity REITs. The RMS represents about 99% of the US REIT universe and securities are classified in the Equity REITs Industry. However, it excludes Mortgage REITs and selected Specialized REITs. The RMS is calculated with dividends reinvested. 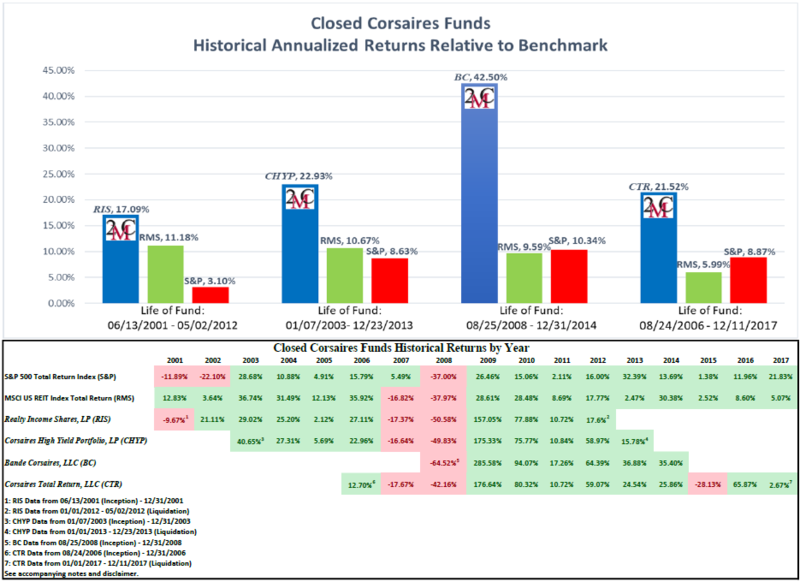 Corsaires Funds are compared to the S&P 500 Total Return Index because it is commonly used to represent the U.S. equity market. The S&P 500 Total Return Index is an index based on the market capitalization of 500 large companies. The S&P 500 Total Return Index is calculated with dividends reinvested. The indices shown are not managed portfolios and are not subject to advisory fees or trading costs. Investors cannot invest directly in the indices. Realty Income Shares, LP (RIS) broke impound and admitted its first investors on 06/13/2001. RIS closed subscription on 07/16/2002 with a total of 75 members and net offering capitalization of $2,429,856. On 05/02/2012, RIS terminated operations and made liquidating distributions of $6,191,509. Over the life of the Fund, RIS paid $2,566,353 in quarterly distributions and $6,502,502 in liquidation proceeds, resulting in total cash disbursements of $9,068,855. Corsaires High Yield Portfolio, LP (CHYP) broke impound and admitted its first investors on 01/07/2003. CHYP closed subscription on 10/31/2003 with a total of 99 members and net offering capitalization of $3,648,203. On 12/23/2013, CHYP terminated operations and made liquidating distributions of $15,980,227. Over the life of the Fund, CHYP paid $2,416,998 in annual distributions and $16,728,355 in liquidation proceeds, resulting in total cash disbursements of $19,145,353. Bande Corsaires, LLC (BC) broke impound and admitted its first investors on 8/22/2008. BC closed subscription on 11/24/2008 with a total of 3 members and net offering capitalization of $626,398. On 12/31/2014, BC terminated operations and made liquidating distributions of $6,707,106.72. Corsaires Total Return, LLC (CTR) broke impound and admitted its first investors on 08/24/2006. CTR closed subscription on 02/26/2007 with a total of 52 members and net offering capitalization of $1,622,594. On 12/11/2017, CTR terminated operations and made liquidating distributions of $10,031,461. Over the life of the Fund, CTR paid $942,542 in annual distributions and $10,314,014 in liquidation proceeds, resulting in total cash disbursements of $11,256,556.